The Westboro Baptist Church seems to be deadset on creating a gospel based on an ideology of high school populism, picketing all those who would have been outcasts during their teenage years. 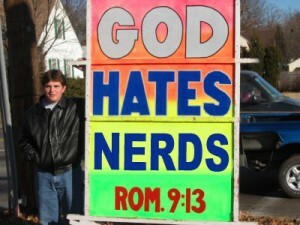 First it was “God Hates Fags” at the funerals of fallen military men and women and now it is the more comical and less sickening “God Hates Nerds” outside of the San Diego Comic Con. Honestly, that rhetoric sounds an awful lot like the reasoning for no artistic rendering of the Prophets (which, taken to a strict theologically consistent route, should actually forbid renderings of Jesus and Abraham in addition to Mohammed) by many Islamic scholars.